In spite of - or perhaps because of - his previously limited background in healthcare services, Kimble Jenkins stepped into his role as CEO of one of the Mid-South's leading orthopedic groups with a fresh perspective that has resulted in new priorities -- and a new name -- for the former MSK Group. 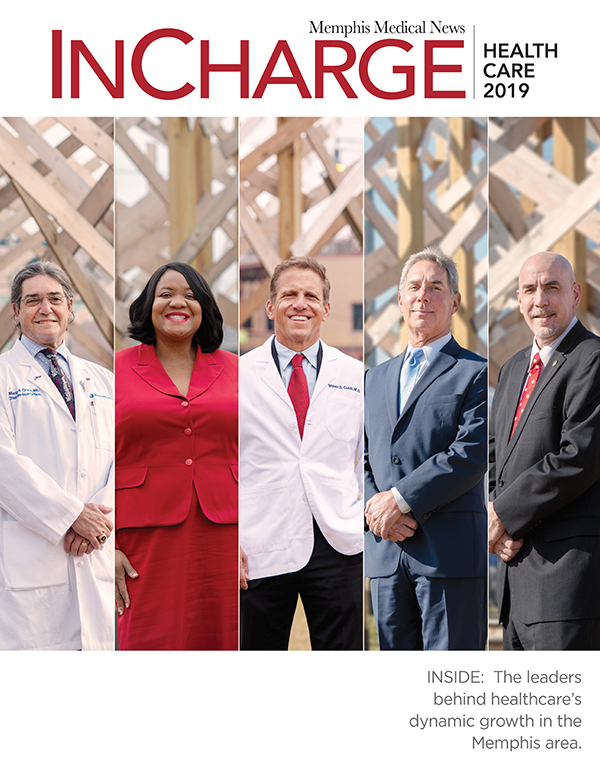 The different set of experiences Jenkins brought to the table in 2017 has, indeed, prompted other ways to problem-solve, as reflected in the strategic focus unveiled March 28, when OrthoMemphis, Tabor Orthopedics and the Memphis Orthopaedic Group announced their common goal of improving the patient care experience -- and doing so under their new name, OrthoSouth. "The three practices have decades-long legacies of providing great orthopedic care -- and great service," Jenkins said. "As OrthoSouth, we're taking it to the next level, and we're really excited about that." OrthoSouth's three-point program evolved from taking a critical look at patient service from the patient's perspective, and was fueled in January by a team from the award-winning Ritz-Carlton Hotel chain, recognized globally for superlative customer service. The Ritz-Carlton experts were brought in to share their secrets with all 400 OrthoSouth employees, equipping them with advanced tools and techniques for providing gold-standard customer service. Employee empowerment was just the first step; OrthoSouth has also introduced live-answer response to all incoming calls, with a greeting from "the warm voice of a friendly call center attendant instead of a recording" -- a welcome return to kinder, gentler times! Another step toward improving convenience and accessibility for OrthoSouth customers is new, 24-7 on-line appointment scheduling. By simply entering their name and identifying the orthopedic issue they're experiencing, site visitors can access a list of doctors, locations and appointment times they can choose from -- and book with just one click. "We've been working hard on implementing what we believe are forward-thinking approaches to improve the patient experience, and we're excited to start bringing them to life under the OrthoSouth name," said Jenkins, who is quick to point out that the transformation has been a team effort. A Texas-born arrival who moved to Memphis with his parents when he was a toddler, Jenkins attended Brown University before acquiring his law degree from Georgetown University Law Center in 1988. Although his career since then has focused on growing multiple companies and businesses, "I've always been drawn to healthcare," he said. In fact, the last such company in which he was involved -- and which he still serves as chairman -- is focused on advancing care for neurology patients. "MRI Interventions (Inc.) grew out of technology at Johns Hopkins in 1998," he recalled. "I helped start the company, which focused on improving care for patients suffering from neurological disorders and diseases." The company develops and commercializes innovative platforms for performing minimally invasive surgical procedures in the brain (ClearPoint®) and heart (ClearTrace -- in development) under direct, intra-procedural MRI guidance. 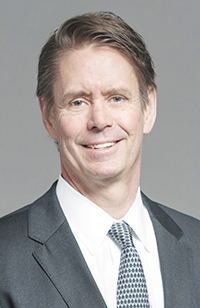 Since 2002, Jenkins had served as both chairman and CEO; but when the company relocated to California several years ago, he chose to remain in Memphis to participate in the MSK opportunity. "The common denominator is healthcare and figuring out ways to improve healthcare," he said. "Healthcare and healthcare services are one of the epic challenges of our generation, so it's fun to tackle little pieces of it here and there. "In MRI, we were obviously deeply involved with patient care; however, at MSK, as a healthcare services company, we are closer to the patient. That's exciting -- and important; it presents opportunities to innovate and improve the healthcare experience." 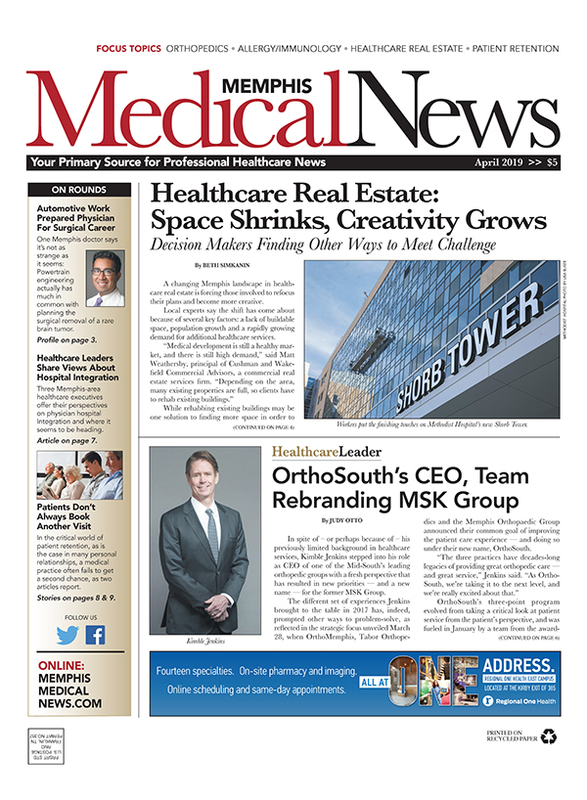 The rebranding of MSK as OrthoSouth is his response to such an opportunity. Jenkins stresses the importance of everyone's role in its team approach to embracing the OrthoSouth transition and all its progressive advantages to both patients and referral sources -- modestly disclaiming credit for the shared vision. Healthcare overall needs an overhaul, he believes. "The care is great, but the experience that most people have, going to see their doctors, leaves much to be desired. We can do better. So we're committed -- every one of us at OrthoSouth -- to doing everything we can to make that happen. Our mission is to be the best orthopedic practice in the United States, measured by the patient experience." OrthoSouth is not alone in its determination to make service better, he notes. "It's where healthcare is going. Patients have a much more powerful voice now than they did 20 years ago, and that's what's driving a lot of these changes. And orthopedics is changing in a big way." He points to the growth of a longer-lived patient population of active people subject to orthopedic injury due to natural wear and tear -- who expect to remain active. He cites improved therapies and technologies available to treat patients, and a welcome "less is more" philosophy: If a more conservative physical therapy option can restore patients to their previous activity level without surgery, drugs, or hospitalization, let's try it. Those surgical procedures that are necessary are now often being done in an outpatient setting -- "a strong trend in orthopedics," he said. "Recovery times are shorter; infection rates and unintended consequences of surgery go down when a patient spends less time in a hospital. Outcomes are better, side effects are fewer, and costs are lower than with hospitalization." Consequently, OrthoSouth has acquired two ambulatory outpatient surgery centers within the last six months. They're also working to alleviate the bane of healthcare patients everywhere --wait times-- and Jenkins hints at other "neat things" also taking shape on their drawing boards. "It's a great time to be in orthopedics," he added, with the energy and contagious enthusiasm that characterizes him. "We're having a lot of fun here!"